You read that right! 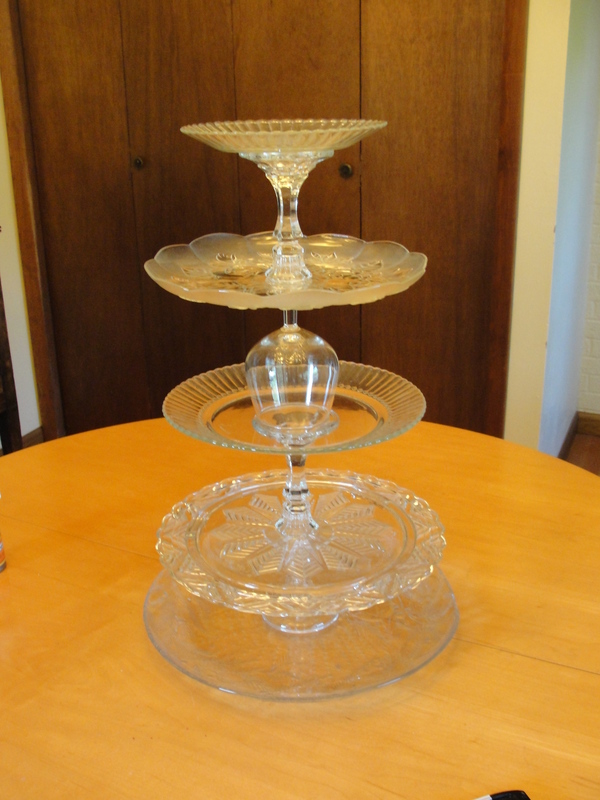 FIVE tiers! We are having cupcakes for Charlotte’s first birthday party, and her theme is Alice in Wonderland. This was really, REALLY easy to do. The best part? It only cost $11 in glassware and $4 for glue. That’s it! I want to give a shout out to Meghan for the idea. She made one of these bad boys, which inspired me to try it on my own. 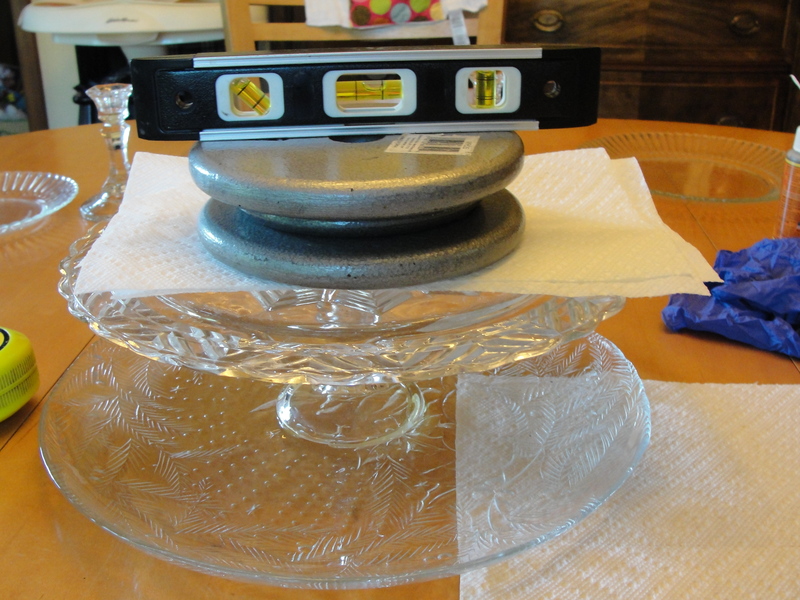 First, I went to a little thrift shop to pick out some plates. I had an open mind going in, and wound up finding a lot of clear glassware. I would have been just as happy with colored or porcelain plates but I went with whatever I could find. 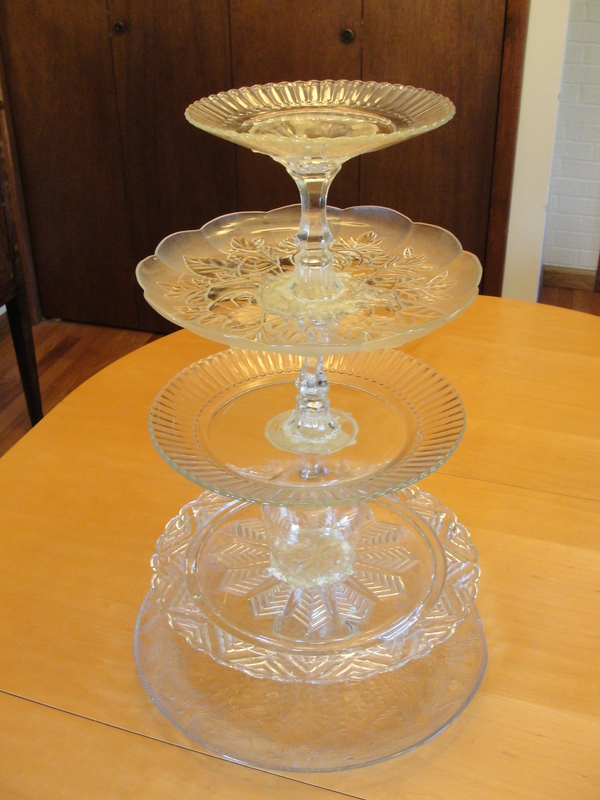 I picked out six plates in different sizes – from a platter to a tiny saucer. 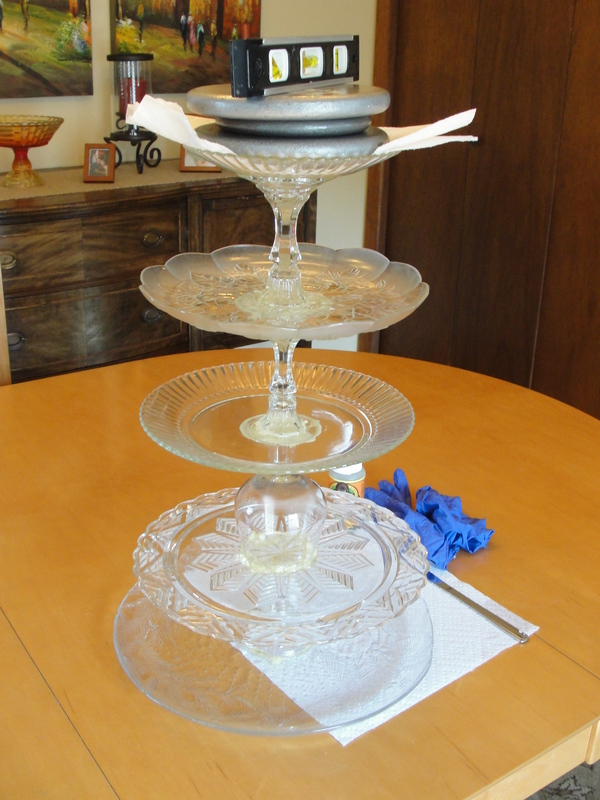 Then, I found three candle sticks and a footed glass to use as supports through the middle. I was looking for glassware that was pretty thick. The footed glass does have a stem, but I stayed away from skinny stems. 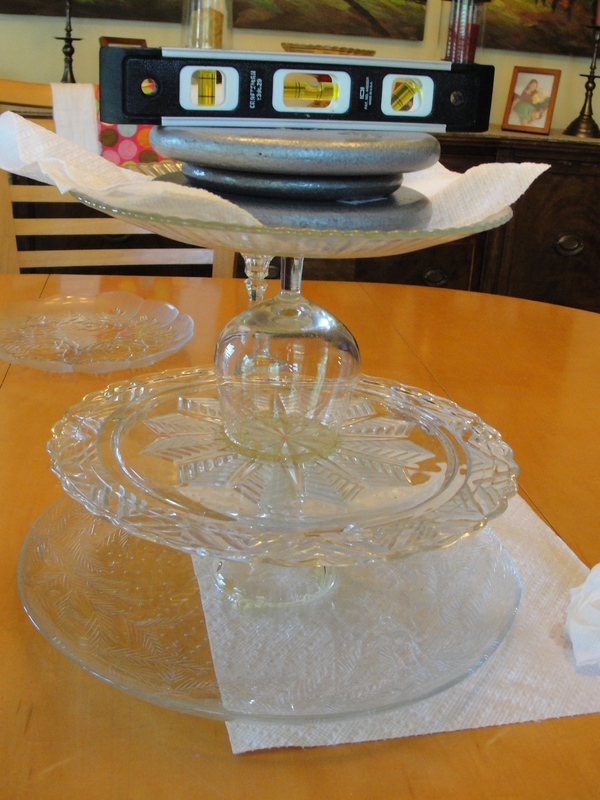 After getting everything home and washed, I stacked the plates to determine what order they needed to be placed. That was when I decided that the tiniest plate wouldn’t be used. I also figured out what order the supports needed to be placed. I started with the heaviest and widest at the bottom, and worked my way up to the smaller pieces. Then, I gathered up paper towels, gloves, and a small level. 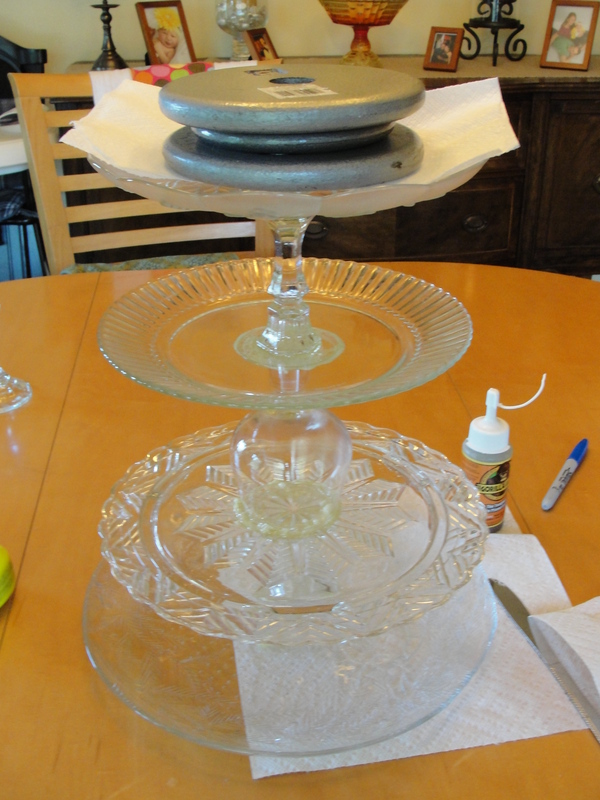 I used weights from my barbells to help set the glue (at least I’m using them for something!) You could also use heavy books. I also bought Gorilla Glue, which promises to stick to almost anything – including glass. A word to the wise – read the instructions before you get started! I dismantled the tower of glass and built it up, one layer at a time. To use the glue, put on gloves, wet both sides, glue, and press down. The glue doesn’t set immediately, so you have time to center everything. 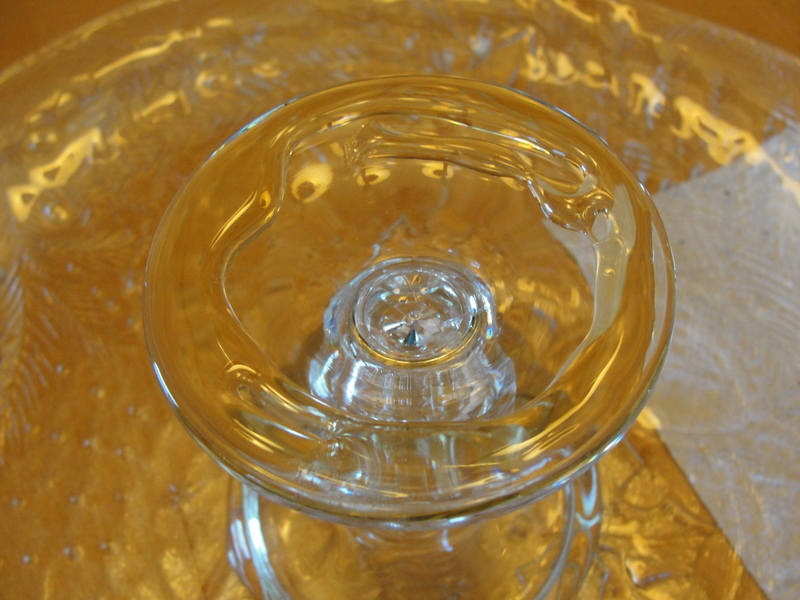 However, the glue does not dry clear – so make sure that you’re not smearing it all over! It’s also very drippy, though it does wipe up with a dry paper towel if you get to it right away. In between layers, I checked things our with the level and put weights on them. I allowed each layer to set several hours before attempting the next layer. That’s pretty much it – Just keep layering up until you’re finished! There’s a little big of excess glue around the goblet, but I don’t think it will be noticeable after we put some goodies on it for the party. Here’s the final product! Easy Peasy, and cheap too! Posted in Get Crafty and tagged Alice in Wonderland, birthday, Crafts, Cupcake Stand, Party. Bookmark the permalink.